DC65 is the most powerful upright vacuum on a ball, with the strongest suction of any other vacuum*. It uses Radial Root Cyclone technology and a reconfigured brush bar to remove more dirt and dust from the home. The redesign of the brush bar means that the bristles have been made shorter and stiffer allowing deeper carpet penetration to remove more dirt, while maintaining superior performance on hard floors. The DC65 cleans better than any other vacuum across carpets and hard floors**. It achieves this through the combination of Radial Root Cyclone technology and a self adjusting cleaner head which seals in suction across carpets and hard floors. The latest Ball technology allows easy steering into difficult places. More key technologies are housed inside the ball, reducing components on the outside of the machine. Removing clutter from around the ball makes it even easier to steer under and around furniture. Other vacuums have a choice of settings for different floor types. This means that when moving from one floor type to another, suction power can be wasted. DC65 has an active base plate which self adjusts to create optimal contact with every floor type. This reduces air leaks and retains more suction power at the cleaner head. 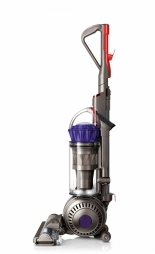 DC65 has the best all around pick-up of any Dyson vacuum. Dyson engineers are constantly testing and investigating, trying to find new ways to make things work better. They improve existing technologies and invent new ones. As they work, they file patent applications to protect their inventions from copycat manufacturers. That’s why the only place you’ll find Dyson technology is inside a Dyson machine. DC65 uses Radial Root Cyclone technology to maximize suction power. Improved airflow efficiency reduces turbulence and preserves air pressure, so more microscopic particles are extracted by the inner cyclones. Dyson engineers have further refined the cyclone inlets and vortex fingers in this machine to generate more suction through the machine – these refinements remove more dirt and dust from the home. Additionally, DC65 has the latest Ball technology; the vacuum’s key components have been engineered to fit inside the ball itself. This gives the machine a streamlined profile, allowing access to tight spaces and lowering its center of gravity to make it lighter in the hand. The redesign of the brush bar – raising the ridge that the bristles sit on, means that the bristles have been made shorter and stiffer, allowing deeper carpet penetration to remove more dirt and less likely to scratch hard floors. Additionally, Dyson engineers have stripped back the design of the cleaner head so that the brush bar has end to end coverage. No more irritating dirty strips at the base of skirting boards and cabinets. The cleaner heads on most upright vacuums need to be manually adjusted for different floor types. If this isn’t done, a gap is created between the cleaner head and the floor – and suction is lost. DC65 has an active base-plate that self-adjusts across every floor type. It maintains close contact with the floor at all times, automatically raising and lowering. Suction isn’t wasted – it’s sealed in. It also has 25% more power than its predecessor to drive bristles deeper into carpets and release more ground-in dirt. This page has been viewed 11575 times.